I think it's a great idea. Why keep something to hate it, or have to lie about what you did with it. Re-gifting saves time and money and we are being community right? What say you? Is it a good idea to re-gift? Hi Colette, thanks for dropping by in my blog post. It is good to re-gift, although in my case i normally don't because i want to remember seeing a gift from someone. But if it's food, of course it will be shared with many. I say if it's still presentable looking and in good condition or still in the original box and you're sure the person who will be getting it is going to like it, there's no problem with re-gifting! :) Hi Colette ~~ Yes, I think it is okay to regift. Just be sure you know who gave it to you so that you can take steps to not let the giver know that you have regifted it and to whom. Thank you for sharing about your childhood. I don't know too much about places where you grew up so I never thought of not having toys. Next time there is a toy drive here I will be sure to have one to give. Jim that is fantastic! A child is waiting for your kindness, I promise! Some regift are great. Some are not. It depends. 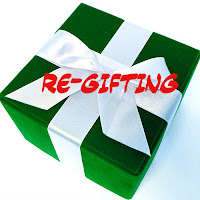 I think if the gift is something you don't use and others can use and love, then definitely it should be re-gifted. I am guilty of regift from time to time, especially when the present was so grand but I have no use for it, then I give it to someone who I know could use it. I was also on the receiving end of the re-gift many times. I don't mind, and I think it is ok. I have no issues with re-gifting a brand new item that I simply won't use. I've often benefited on the receiving end of a re-gift too. One big thing I re-gift often is the baskets of soaps and lotions or the cheese and sausage gift baskets... you know, the basic gifts that you get from acquaintances that don't really know you well. ;) Many don't know about my extremely sensitive skin and I'm not very obvious about being a vegetarian. I just try to make sure I never re-gift an item within the same circle of friends or relatives. I definitely re-gift, but before I do I ask the giver. Many times someone will give you something they secretly want themselves. Of course you have to very carefully word the request so as not to hurt their feelings. I always appreciate the thought and sometimes sacrifice that goes into gift giving and always want to let the giver know that. The Choice You Have Is a Gift - Use It!